The Shirescenes etched brass conversion sides for the Ratio four-wheelers have considerably expanded the scope for those less experienced with GWR coach kits. Though perhaps not for the complete novice, these sides have been prepared for glue assembly and constitute a natural progression from the Ratio kits themselves. It has to be said that the kits are not entirely accurate in one or two areas, and some involve slightly tricky operations. However, they are a relatively cheap and quick way to acquire some very useful coaches that are not seen so often on GWR layouts. The Shirescenes range constitutes a number of different types. This page concentrates on the Holden "Metro" coaches, of which two types are available. However, most of the construction notes for these particular kits are generally applicable to the Shirescenes range. The Holden four-wheelers were introduced for the London suburban services in 1880, and were manufactured to varying diagrams until the turn of the century. They were designed by William Holden before he moved on to the GER, and were easily recognisable by the distinctive half-circle shape of the door vents. The Shirescenes sides for the Holden vehicles constitute a full Third to diagram S17, and a Brake Third to diagram T59. 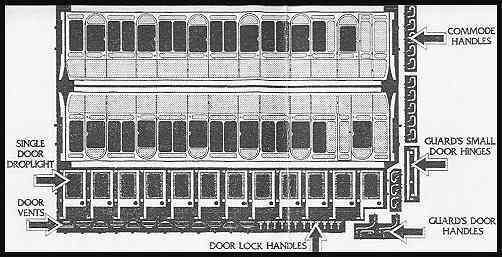 Note that some coaches of these diagrams also ran as Second Class coaches in the early years - apparantly, the only difference was in the upholstry. The "Metro" coaches ran in close-coupled sets in suburban London until the 1920s, at which point they were disbanded as sets and distributed for ordinary branchline work around the system. Like the rest of the four-wheels types, many ended their days as departmental stock or as workmans trains in the 1930-40s. The S17 and T59 offer a good opportunity to add a bit of difference to a GWR layout: The most obvious potential of the kits is to use them in a suburban setting - a scene that is surprisingly rarely modelled. That said, the lack of any First class types in the Shirescenes range is a bit unfortunate, since suburban rakes of these coaches usually included such accommodation. You can choose to ignore this and make up a rake of Thirds only, or you can compromise and add the Ratio Composite. The latter is not entirely inappropriate, as some non-Holden four-wheelers also worked the suburban services, although usually in sets of their own. Alternatively, you could add a kit from the more sophisticated Roxey Mouldings range, but note that these are etched brass kits, and thus require some kit-building experience. Another option is to go for a workmans train, composed of a short rake of S17s and T59s. During the 1930s, these trains were painted in the somewhat dingy all-over brown - a less challenging paint-job for the modeller than the more complex chocolate and cream. Well weathered and worn, and perhaps with various modified details such as the removal of stepboards, these coaches can represent a characterful picture of a rarely modelled type of train. Finally, branchline modellers can use these coaches to add variety to a rake of Ratio four-wheelers set in the 1920s-1940s. During this period, the Holden Metro stock was mixed with ordinary four-wheelers in several instances - including the Faringdon branch, where two Holden Brake Thirds ran with a U4 for several decades. Firstly, the Ratio ends used with the Shirescenes sides are in fact incorrect for the Holden Metro stock. The Holden coaches had six end panels, while the Ratio ends only have five. Secondly, the London suburban sets were slightly reduced in height compared to other four-wheelers, and the kits do not represent this. The latter will really only be apparant if you run the different rakes simultaneously, but the end-panel problem will inevitably be visible to those who notice such things. I see no practical way of solving this one - but then again we OO modellers don't much like to view our rakes end-on anyway! The instructions are brief but to the point, and come with a photocopy of the etch (see below), which gives an overview of the main parts. Note, however, that the instructions do have one major shortcoming: While the T59 uses unmodified parts from the Ratio Brake Third, the S17 uses the Ratio S9/U4 chassis and roof, both of which require shortening by approximately 9mm. The instructions are really not very clear about this, and someone without a drawing may miss this rather significant fact entirely. I found this the most tricky operation, although a little patience and care is all it really takes. Rather than shortening each of the individual components, I simply built the underframe to the standard Ratio instructions, and then carefully cut 9mms out of the middle of the underframe with a razor saw. The two shortened halves were then filed to a good fit, re-assembled with superglue, and reinforced on both sides with Platsikard. The stepboards were re-joined with a very thin slice of plastic glazing, while the brake rods were replaced with Alan Gibson brass wire. Again, a section of approximately 9 mm was cut out from the middle of the roof, and rejoined after much careful filing and sanding down. A join such as this is very visible in roof-tops, so I used Liquid Poly glue, as this dissolves the plastic slightly and allows for a good join. Any visible parts of the join were subsequently smoothed out with filler. An alternative approach could be to do the shortening from one end, thereby avoiding the join. That, however, would mean loosing the end profile of one of the roof, and off-setting the balance of the rainstrips. The kits comes with 'Swan Neck' grab handles, as an alternative to the standard ones provided with the etch. All my documentation shows the Swan Neck type used on the Holden four wheelers, so I followed suit and used these. This is rather fiddly work, especially since the holes provided are for the standard handles, but once done it does look good. Other detailing included replacement Mansell wheels from Alan Gibson, and 'early short coach buffers' from the same source. I am not sure these buffers are to the correct pattern, but it was a sunny day and there are other things in life.